It is the 21st of December and winter is officially here. Though it is cold and though snow lies thick on the ground, there is much to see and to do outside. 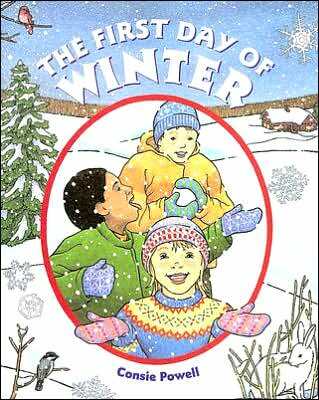 Let us share the first twelve days of winter and see what we can find out about this wonderful season. There are lots of beautiful trees to look at, both green evergreens and those that are bare; there are animals too - all you have to do is open your eyes and listen carefully and you will find them. Of course there also hills to slide down, snow angels to make, skating to try, snowshoes to walk on, and ice forts to dig and stock with snowballs. This is a book which can be enjoyed on many levels, There are the children to watch as they play outdoors, as they roast marshmallows in the fire, and as they explore the wonderful winter world around them. Then there are also hints and clues, both in the text and in the pictures, that the author gives the reader on every double page spread, encouraging him or her to try to find creatures of all kinds in the illustrations. Bit by bit the reader will get a sense of how alive the winter landscape is if you know how to look and listen to the sites and sounds of nature. In the back of the book the author provides her readers with further information about the twelve topics which are referred to in the book. These include facts about winter, how animals like to slide on the snow, how snowflakes are formed, and what you can do to attract animals to your feeders.